Microsoft has announced that it is planning to acquire LinkedIn, the social network for professionals, for $26.2 Billion in cash. 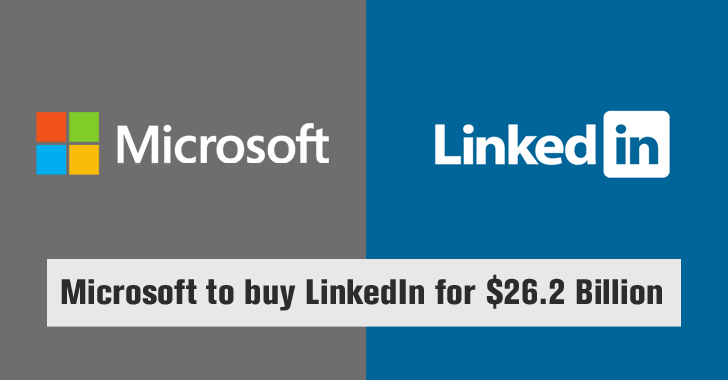 Yes, Microsoft announced today that it would buy LinkedIn for $196 per share in an all-cash transaction valued at $26.2 BILLLLLLION. It is so far the biggest acquisition made by Microsoft, which has made 8 takeovers, including Skype in 2011 and Nokia in 2013, worth more than $1 Billion. According to the tech giant, LinkedIn will retain its own brand and product, and also LinkedIn's existing CEO Jeff Weiner will remain as the company's chief executive. LinkedIn will now become a part of Microsoft's productivity, and business processes segment and Weiner will report directly to Microsoft CEO Satya Nadella. "The LinkedIn team has grown a fantastic business centered on connecting the world's professionals. Together we can accelerate the growth of LinkedIn, as well as Microsoft Office 365 and Dynamics as we seek to empower every person and organization on the planet." The offer of $196 per share on LinkedIn represents a premium of 49.5 per cent to LinkedIn's Friday closing price. LinkedIn is the world’s most popular as well as largest professional social network and continues to grow. With the launch of new version of its mobile app last year, the company has increased its member engagement and enhanced its news feed to deliver better business insights. Both Mr. Weiner and LinkedIn’s chairperson, co-founder and controlling shareholder Mr. Reid Hoffman back the deal. "Just as we have changed the way the world connects to opportunity, this relationship with Microsoft, and the combination of their cloud and LinkedIn's network, now gives us a chance also to change the way the world works," Weiner said in the statement. "For the last 13 years, we have been uniquely positioned to connect professionals to make them more productive and successful, and I’m looking forward to leading our team through the next chapter of our story."